The Hurricanes have been shut down by a blizzard. 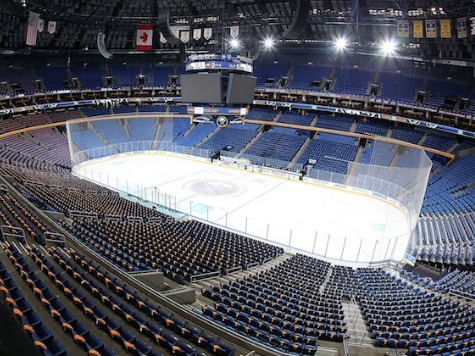 The last time the Sabres had a game postponed was at Buffalo against New Jersey on Dec. 6, 2000. They played the following day. The Hurricanes (18-16-9), coming off four straight wins, got to Buffalo before the brunt of the storm hit Monday afternoon. The weather, however, prevented both teams from holding their usual morning pregame skates. Hurricanes spokesman Mike Sundheim said the team will stay in Buffalo overnight and travel home on Wednesday. Rescheduling the game could prove difficult in the near future. The Hurricanes host Toronto on Thursday, before traveling to play Columbus on Friday. Starting Thursday, Carolina plays 14 games in 31 days leading up to the NHL’s Olympic break. The Hurricanes’ only extended break during that stretch is a four-day span which conflicts with the Sabres playing two games. Buffalo (12-26-4) next plays at home against Florida on Thursday, which opens a stretch in which the team plays 15 games in 29 days. The Sabres have won five straight at home, their longest streak since winning six in a row from Jan. 17-Feb. 15, 2007.